"United States Revolutionary War Pension Payment Ledgers, 1818-1872," digital image, FamilySearch (https://familysearch.org :, accessed 23 September 2016), 4-vol D Revolutionary War pensioners, page 87 (image 84 of 459), Thomas Dill, died 1839 ; citing Massachusetts, United States, NARA microfilm publication T718 (Washington D.C.: National Archives and Records Administration, 1962), roll 4; FHL microfilm 1,319,384. Thomas Dill's pension was $8 per month. The payments were made in March and September of each year. I have no idea what the payments in March and September are. Are they the number of months worth he was paid? The numbers total 33, for the 5 plus years he was paid. The table says the last payment was in the first quarter of 1840. There may be another record for earlier payments for this pension. 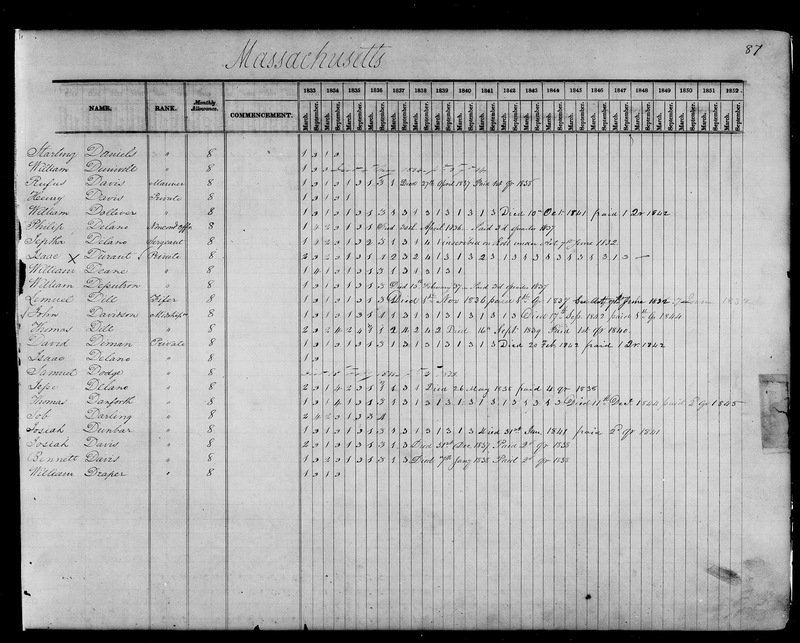 However, this was the only page that was located by a search on FamilySearch in this database. The death date given is the only death record that I have found. Previously, I had only the letter from his son, James H. Dill, dated 20 August 1836, in the Revolutionary War Pension File asking if he was eligible for his father's pension. I noted that there is also a death date given, as 1 November 1836, for Lemuel Dill, apparently of Hingham, Massachusetts.